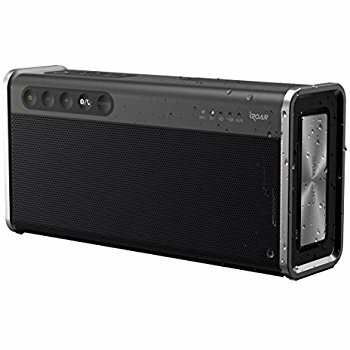 The Iroar Go Weatherproof Bluetooth Speaker from Creative is a perfect purchase for the summer months. It will yield tremendous sound that is surprisingly loud for the a device size of the Iroar Go. The speakers provide great highs and lows, ensuring that one can bounce through rap, rock, and even podcasts without the sound seeming distorted or otherwise “off”. This is largely done through the “Roar” button which provides an equalization effect that is a bit more customized than factory settings. The speaker can be placed in one of two distinct configurations, allowing for a wider radius or a more in-your-face sort of sound. Battery life is not a major concern for the Iroar Go; we were able to crank up the speaker and play it without recharging for the better part of 6-8 hours. The product is able to stand up to repeat dings and drops, meaning that it can be stashed away in a car or trunk and brought out whenever tunes are required. Finally, the connectivity of the iRoar Go means that one will be able to get the speaker working, no matter what sort of connection is available. Bluetooth, microSD, aux cords, and USB connections make it easy for everyone to hear their favorite music even when out in the middle of the woods. The Iroar Go is available from a wide variety of online and brick and mortar retailers for around $190. Additional information about the entirety of products that Creative Labs creates is available at their main domain, while their social media profiles are perfect places to locate information about new products. Check out our previous coverage / reviews of Creative Labs products, including the Sound Blaster Inferno Headset and Sound BlasterX Kratos S3 .